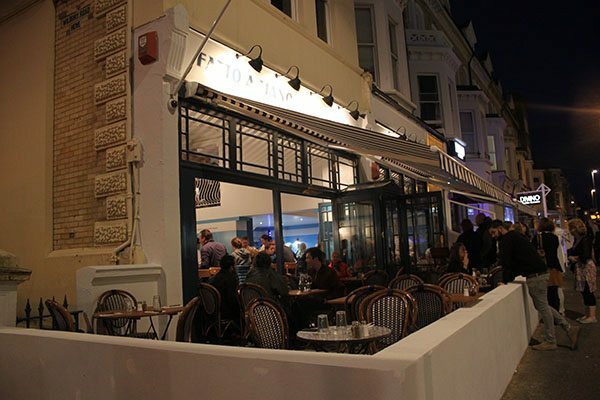 It’s the new kid on the block, and the residents of Hove are super excited about Fatto a Mano coming to Church Road if the queues outside tonight are anything to go by! Granted, it is prime time on a Friday night, but this is something else. 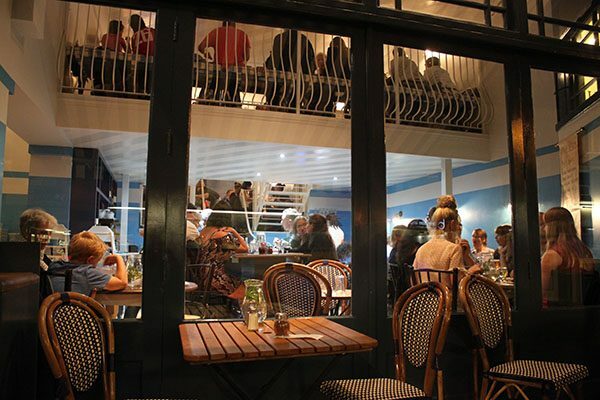 After a mix up on our part by calling the wrong restaurant to reserve our table, we decide that it’s a nice enough September eve to sit outside and observe the hustle and bustle from outside. Stress levels must be high, but the staff seem cool, calm and collected – this clearly isn’t their first rodeo. Our incredibly friendly and smiley waitress, is very accommodating, and despite Fatto a Mano bursting at the seams she is happy for us to set up camp outside (the conspicuous camera hanging around my neck, may have helped?). Later they will have to turn people away, because management have quite rightly identified that the kitchen will not keep up with the number of bums on seats. I am impressed that they make this call; it is nice that the staff care about their diners’ experience! 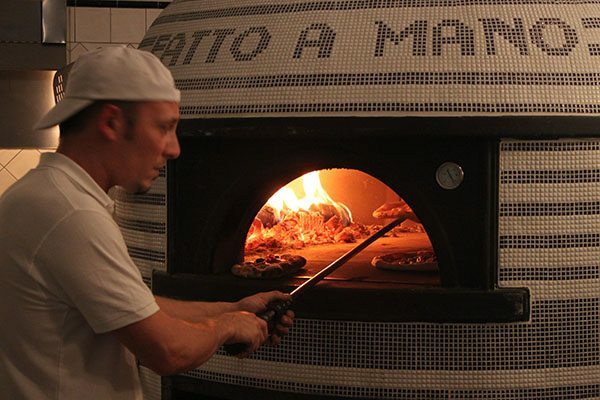 The menu is small with a perfect selection of Neapolitan pizza made with dough that is ‘soft and pillowy, rather than thin and crispy’, made on site every day, proved for a minimum of 24 hours, then topped and cooked in a wood fired oven at 450+ degrees. A modest number of Starters and Sides, four ‘White’ (without tomato) and six ‘Red’ (with tomato) classic pizzas and three ‘folded’ options, two Calzone and one Saltimbocca, and two salad options make it up. 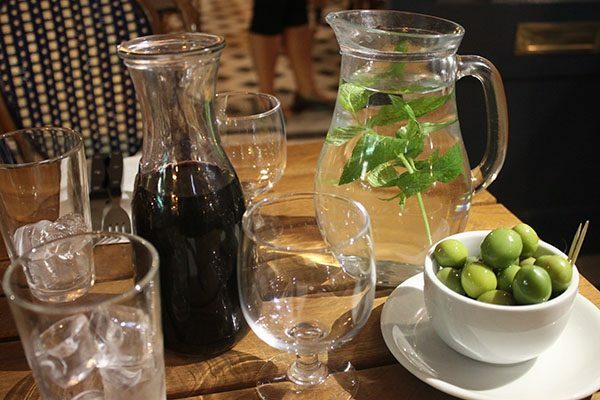 From ‘Drinks’, we order a carafe of Chianti Rufina Fattoria Di Basciano (£11), which is the same price as two large glasses, though we ponder that we might get slightly more wine? I can’t go ‘Italian’ and not order olives and I am thrilled to see my all-time favs are available here. 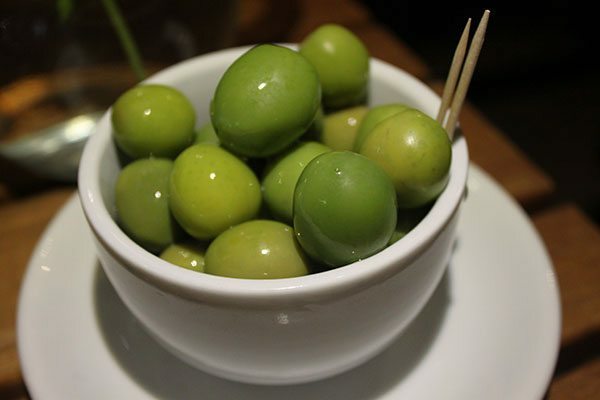 The Olive Silciliana (£3.50) has to be the most beautifully green, juicy and flavourful olive that exists, and if it is not… I look forward to the day when I am proved wrong. 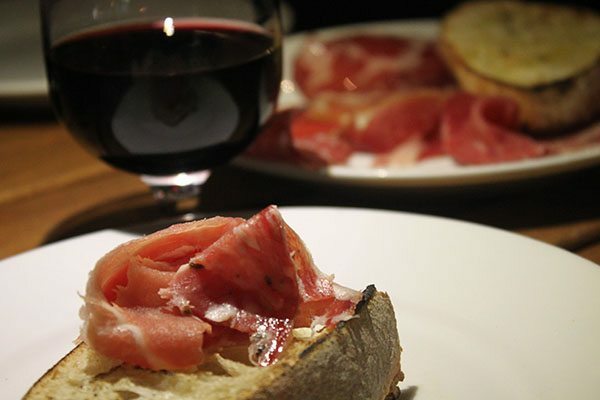 My partner just loves Italian cured meats, so he goes for the Affettato Misto – Parma, Capocollo, Finocchiona (£6.50) – as a starter dish. We are read the specials, which are simply one ‘Meat’ and one ‘Veg’, both sounding equally delicious. 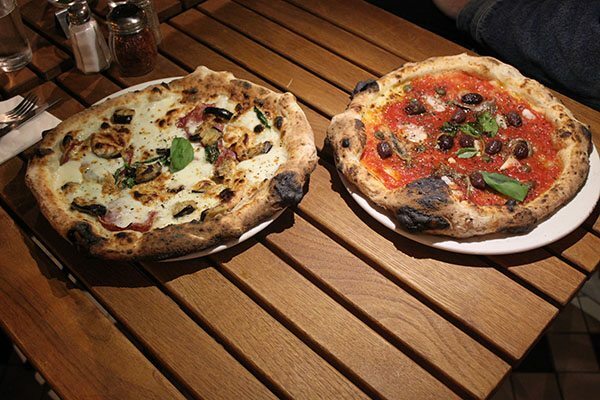 We make our choice quickly, trusting our instincts with the meat special and the ‘Napolitana’. This way we have one with tomato and one without. The waitress asks us if we want cheese on the Napolitana as this is optional and in fact not mentioned as an ingredient on the menu. I ask how the pizza is traditionally served and note that as there is fish on the pizza, it is probably without cheese. She confirms this for me and we tell her we would like the pizza to come as it should do, so no cheese please – ‘like the Italians would have it’. She seems happy with our response. Starters impossible not to devour! The starters arrive. The meat selection looks glorious, vibrant and plentiful. Our waitress has kindly requested it come with an additional piece of crispy ciabatta bread, as there are two of us sharing. This is a big starter, especially in consideration of our pizzas to come, but it is also delicious and impossible not to devour. This no frills dish is any meat lover’s dream. The quality and flavour of each different meat needing nothing else – classic Parma Ham or prosciutto di Parma, wonderfully thin sliced cured ham produced specifically in the Parma region of Italy; the Capocollo is a traditional Italian and Corsican pork made from the dry-cured muscle of the pork shoulder or neck and has a delicate flavour with cinnamon spiced notes and tender, fatty texture; the Finocchiona – as raved about by our waitress – is a kind of salami of chopped pork meat (generally cheek, shoulder, or belly), fennel seeds, red wine, salt, and pepper, tasting distinct and leaving you wanting more with each mouthful. We know once we polish of our starters that we’re likely to go home with doggy bags/pizza boxes. We also know that in the name of ‘review’ that Tiramisu we’ve eyed up on the dessert menu will have to be sampled. So we are grateful for the slightly longer than average wait for our mains to arrive. It gives us the perfect opportunity to let our food digest and to sit back and absorb the atmosphere. It’s easy to forget yourself sat outside Fatto a Man as the sun goes down and the world goes by. You might just be in Italy and not in Hove at all. There is something so satisfying about the way pizza looks. It’s something to do with the multi coloured nature of it, the chaotic way the ingredients are scattered on top; and the sheer size of it, often spreading over the edges of the plate it is served on. It’s seriously unpretentious and comforting food. These pizzas don’t disappoint flavour wise either. The Napolitana is rich and salty, with a beautifully balanced tomato sauce. The addition of cheese would have been wasted amongst all these strong flavours; the hit of olives, capers and anchovies make this a pizza for people who aren’t afraid of strong flavours; and the oregano, garlic and basil notes complement the tomato. The dough is ‘pillowy’ just as we are promised. It is not stodgy though; it is light and easy to eat and takes nothing away from the topping. The ‘Special Meat’ pizza (‘White’ with no tomato) looks equally as impressive. 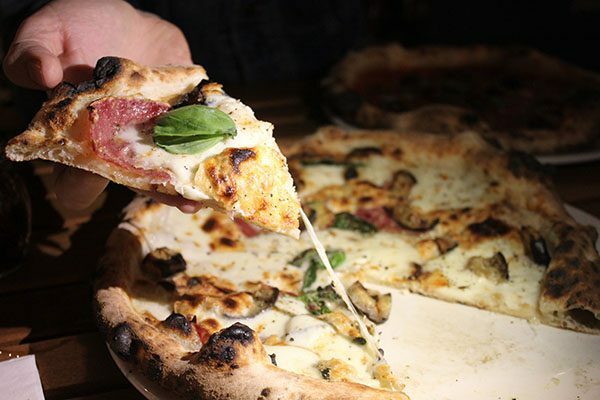 Big chunks of aubergine ‘funghetto’ (which refers to the way the aubergine is cooked, reminiscent of the classic sautéed mushrooms) pepper the pizza and curls of that beautiful Tuscan Finocchiona flick up about the splattering of melted mozzarella cheese. The flavours in this pizza are more subtle, but in perfect harmony with each other. The fennel in the meat is clearly detectable, but not too overpowering; the smoked Provola pairs with the Finocchiona perfectly, enhancing the taste of the meat. If it wasn’t for the Tiramisu (£5), we’d have happily taken the last of our pizza home and called it a night. 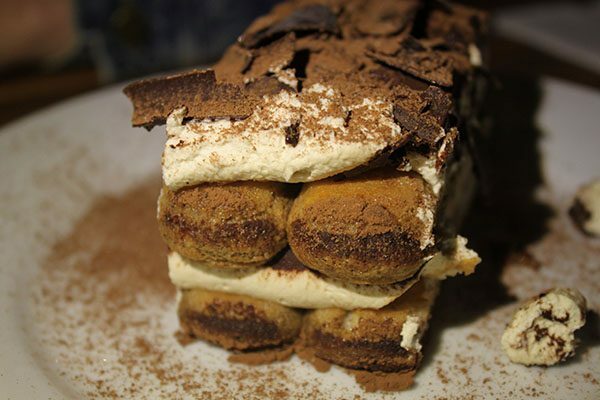 But there you have it – I’m weak in the face of a Tiramisu … and there is more than enough here for two. We share our way through the creamy, coffee, chocolate covered delight of a dessert without too much trouble at all. It is as if we have forgotten the food that has come before it. This is a proper dessert. And a great Tiramisu! 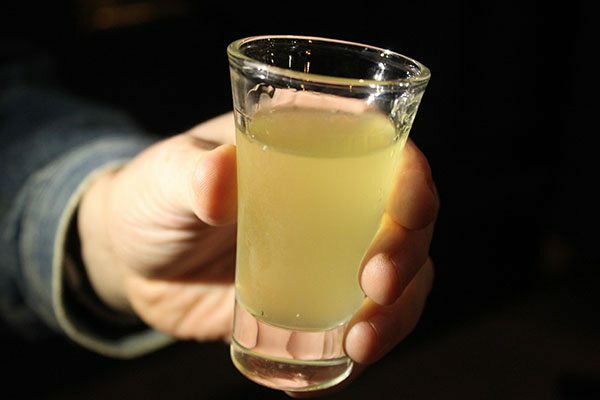 Shortly after we have licked the last cream covered spoonful clean, our lovely waitress brings us two complementary shot glasses of Limoncello (a digestivo). Super sweet and syrupy – I certainly couldn’t drink more than one of these – this is a nice touch and aptly finishes off a great evening of Italian food. This is Fatto a Mano’s newest and second restaurant. Starting out on London Road and making a name for itself, this expansion makes perfect sense. Many restaurants have been and gone from the space where Fatto a Mano now stands on Church Road. But experiencing the wonderful buzz here this evening makes me sure they won’t face the same fate. It is of course true us foodies flock to try out the latest grub on offer; sample the newest cuisine; and dine in the newest establishments. Queues don’t bother us, they just make us all the more determined – we need to see what all the fuss is about. This ‘fuss’ might die down, but what should remain is a solid, ‘go to’ restaurant, that you’ll never grow tired of visiting. The important thing is, the food is great at Fatto a Mano and with a menu as thoughtful and reasonably priced as this – it is accessible too.